Rajasthan government officials, industry representatives and civil society came together in Jaipur this month for the public launch of Child Labour Free Jaipur (CLFJ), a unique initiative to end child labour in the city. The Initiative aims to position Jaipur as a city with unprecedented commitment to stopping child labour by strengthening its industries and serving as a model for other cities to follow. As part of the Initiative, CLFJ is strengthening partnerships between the Rajasthan and Bihar Governments, to allow smooth repatriation of trafficked children from Rajasthan back to their home state of Bihar. The Initiative has already begun to work closely with Juvenile Justice Committee, Child Welfare Committees, District Child Labour Task Force, and the Centre for Child Protection Rajasthan Police University to increase successful prosecutions against child traffickers, increase care and protection of children and train police and investigation officers. On 18 January, stakeholders joined hands at the launch of the program in Jaipur, pledging they would spread awareness about the need to end child labour in Rajasthan’s capital. The governments of Rajasthan and Bihar will take joint action to stop trafficking of children from various villages of Bihar to the workshops in Jaipur. At the same time, because many child labourers are working in home based production units in Jaipur with their own families in harmful conditions and for excessive hours, the Initiative is working with residents in key neighbourhoods to help parents keep children in school or in skills training. CLFJ’s launch received widespread coverage in Indian media, including in The Hindu, The Times of India and Outlook India. 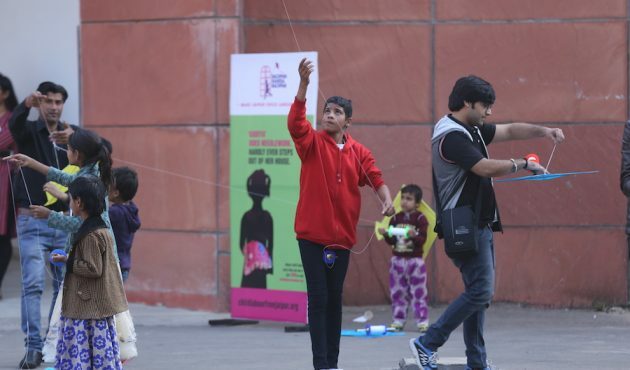 CLFJ is engaging with local communities to build resistance and raise awareness through billboards, bus shelters, posters and cultural activities such as street plays across the city, urging the public to call Childline (1098) if they see child exploitation in Jaipur. Partners of CLFJ in Bihar will also work towards successful support for recovery of victims, including access to compensation, enrolment in school and regular follow-up visits, to prevent re-trafficking. The Child Labour Free Jaipur Initiative is a multi-stakeholder partnership with broad-scale support from state and district level governments, businesses, civil society organisations and local communities. It is supported by Children’s Investment Fund Foundation, the British Asian Trust, C&A Foundation and The Freedom Fund. Pictured: Children in Jaipur at a mass kite-flying to celebrate the public launch of Child Labour Free Jaipur, 18 January.